Edgy Softie is made with bamboo viscose material for a soft and comfortable fit. 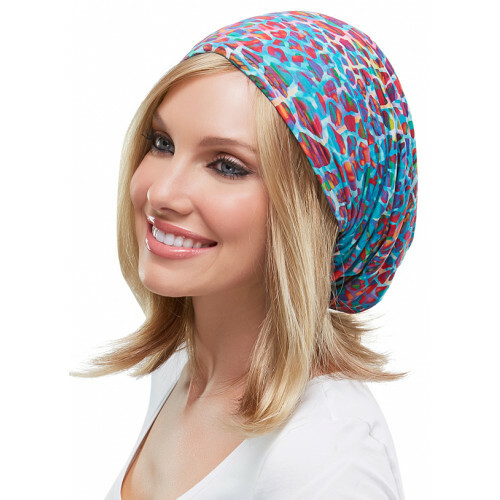 This cap is perfect..
Add a dash of color with this double-lined Bamboo Viscose soft head cover from Jon Renau. Soft and c..
Add a dash of color, a little sparkle, some pizzazz with this beautiful, Bamboo Viscose Beanie from ..
Add a dash of color, a little sparkle, some pizzazz with this beautiful, Bamboo Viscose Wrap from Jo..
Add a dash of color with this beautiful, Bamboo Viscose soft head cover from Jon Renau. Soft and com.. The classic Softie cap with a new, elegant design element. Made from the ultra soft Bamboo Viscose, ..
Our classic Softie cap with a new fun design element. Double bamboo lining protects against rubbin.. The Simple Softie by Jon Renau is a cute and comfortable cap. It can be worn with or without your wi.. These super sleep caps feature a stretch lace band, and are smooth, comfortable and non-irritating..
Stretchy and comfortable, this large Sleep Cap provides full head coverage for larger head sizes. Th..
Made from the softest Bamboo Viscose fabric, this headband can be worn over a Softie as an accent or.. These soft cotton/polyester blend hats are smooth, comfortable and non-irritating for even for the..